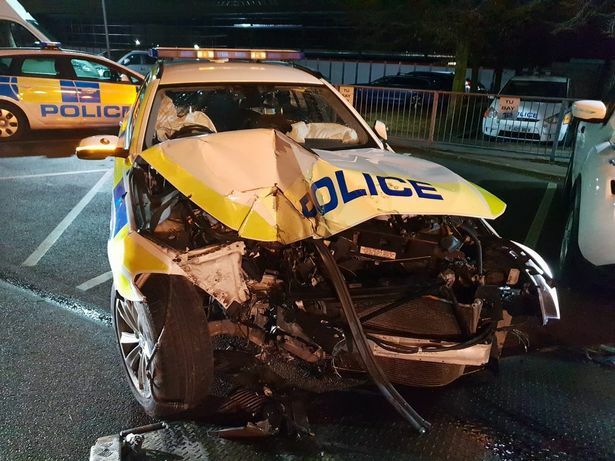 A police car ended up badly damaged in the course of a 35-minute chase over the weekend which led to multiple crashes around the south of the city including Enderby. Reports in local media say two officers were also injured during the incident. Police were tipped-off that a man wanted on suspicion of assault was at an address in Braunstone Lane, Leicester. Officers attended at the address and were assaulted by a man who then escaped the scene in a vehicle. Police, including armed response officers, engaged in a pursuit chase that included locations of Braunstone, Enderby and Oadby, during which the suspect vehicle was reported to have been involved in a number of collisions. One of the collisions happened close by the Leicestershire Police Headquarters at St John’s, Enderby. One eyewitness told Leicestershire Live he had seen the pursuit as it passed Grove Park and Fosse Park, close to police headquarters. At that point, according to the witness, “….officers made an unsuccessful attempt to ram the car off the road”. The police vehicle (Lead image: @LeicsPoliceARV) is understood to have been damaged when it struck a wall close to the Force Headquarters. Police are reported to have employed “TPAC” (Tactical Pursuit and Containment) tactics to bring the car to a stop – a defined set of manoeuvres designed to conclude pursuits swiftly. Later, in a tweet, the Police said “Top job by all involved, no serious injuries, but just a reminder of the realities of this job”. The suspect vehicle was eventually stopped in Oadby, around five miles from where the whole incident began. A 34-year-old-man was arrested on suspicion of assault and dangerous driving. The man was later released under investigation in relation to the dangerous driving and on conditional bail in connection with his arrest for assault.